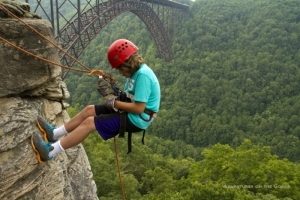 Climbing guides and climbing schools operate near most primary rock climbing areas in West Virginia. Services include beginners programs, advanced instruction and expert advice on remote and challenging climbs. Guides can be particularly helpful in leading groups into remote climbing areas. One of the New River Gorge region’s oldest and most prestigious guide companies, Adventures on the Gorge, formerly Class VI, can customize half-day and full-day climbing excursions with thrilling adventures on the New or Gauley rivers for one of the most exciting outdoor vacations you’ve ever experienced. We employ a small group of expert climbing instructors with extensive experience and exceptional safety records to guide tours and lead our climbing courses. We’ve crafted programs especially for families, student groups, scouting troops, and corporations. We also provide military and guide training and certification courses. Since 1994, our rock-climbing school and guide service in Fayetteville, WV, has introduced thousands to the fundamentals of climbing. We offer beginner’s full-day and two-day courses, full-day or two-day intermediate courses, sports climbing and self-rescue clinics, and group clinics.